From the camp you can walk or take the shuttle to the Mt. Everest “observation area” – a place at the mouth of the valley marked by the small hill richly decorated with Buddhist Prayers Flags and Rock Piles. From there (if you are lucky) the unspoiled view on the Quomolangma enfolds in front of your eyes. Far enough from the tent-city, jeeps, souvenir stands and other “stuff”, grasping the oxygen from the thin air - you can spend time with Mother Nature humbling yourself in front of such stunning raw beauty and incredible power. Unfortunately the best visibility of the Mt Everest usually comes during the winter time, but I do not suggest such experience unless you are one of those well seasoned, ready for everything, “hard-to-die”, stubborn adventurers. So if you are a typical “summer time” visitor, the best you can do is to hope for the generosity of the Mother Nature. 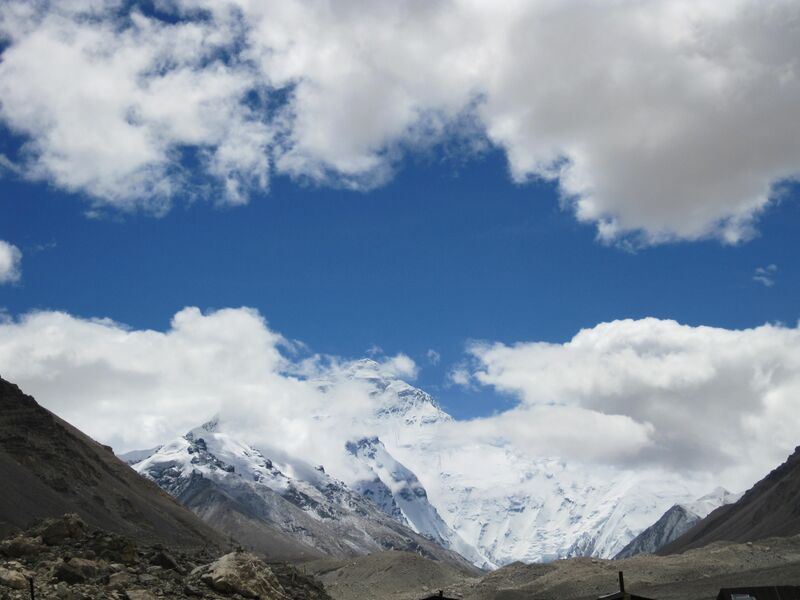 For those less fortunate, this website provides a memory of what you have may missed – the free Mt Everest and North Base Camp pictures. Please take the tour to see unseen and/or revive the emotions from your visit to Himalayas. Rock piles bring the touch of human hands this seemingly lifeless landscape. At about 5500 meters above the sea level (more than 18000 ft) there is no much life to be seen around. Rocks of different sizes and shapes are spread around in a random pattern guided by the forces of nature.